I found this interesting paper  and decided to sum up some of the work done by the Kaim group. If you run Ugi-reactions or related ones you will frequently find a lot of stuff done by his group. Btw. 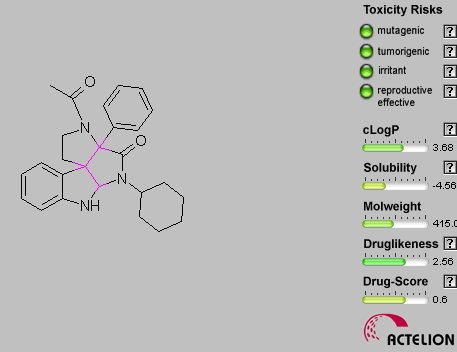 : this is really a nice tool (http://www.organic-chemistry.org/prog/) for having a look at the druglikeness of your substances. 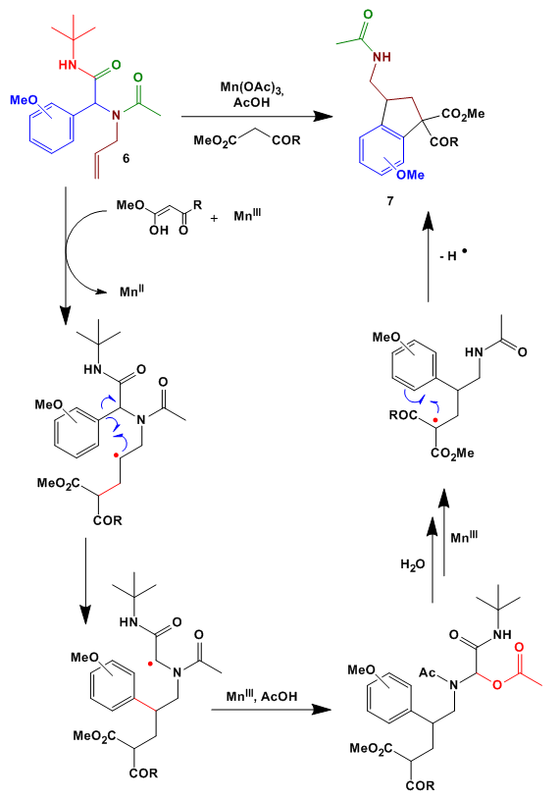 I think most of you are familiar with the Ugi reaction mechanism so I skip this and show you the cool cyclization step. 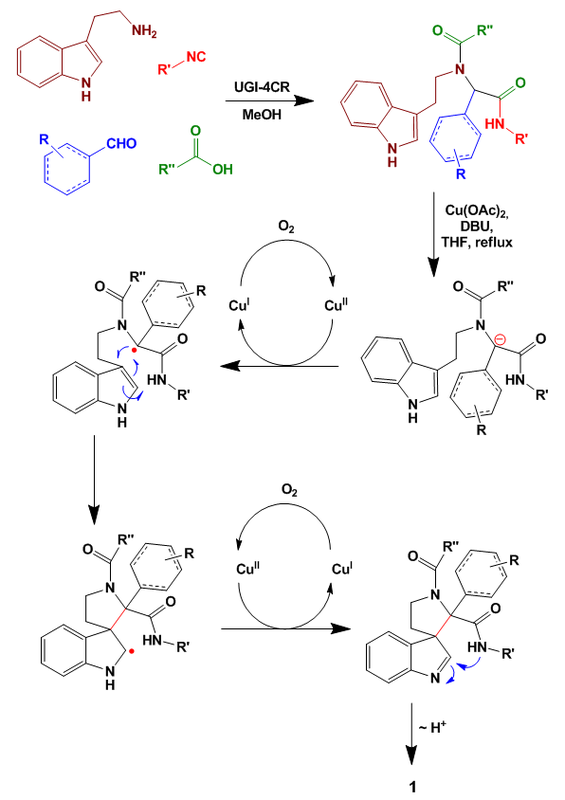 It was postulated that the base produces a carbanion which is directly oxidized by copper(II). This radical attacks the 3-position of the indole moiety and closes the pyrrolidine ring. The resulting radical is then oxidized to an imine. Subsequently the pyrrolidinone ring is closed by attack of the amide nitrogen onto the imine. You can run the whole reaction sequence in one pot without any need for purification. Just evaporate the methanol from the first step, add copper(II), DBU, THF, and reflux. A lot of derivatives were made but as usual to date with the Ugi-reaction only as racemates. 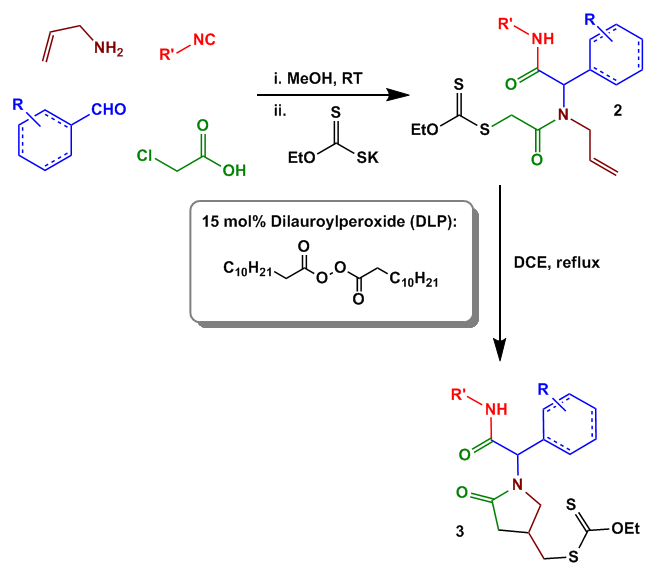 I was wondering if it might be possible to do the cyclization step stereoselectively because the stereocenter from the Ugi step is lost during deprotonation. They designed some xanthate esters and cyclised them to yield different lactams in the presence of DLP. The mechanism is shown below. DLP generates a carbon based radical which in turn attacks the xanthate ester to give the more stable acyl radical. This cyclizes to the lactam. 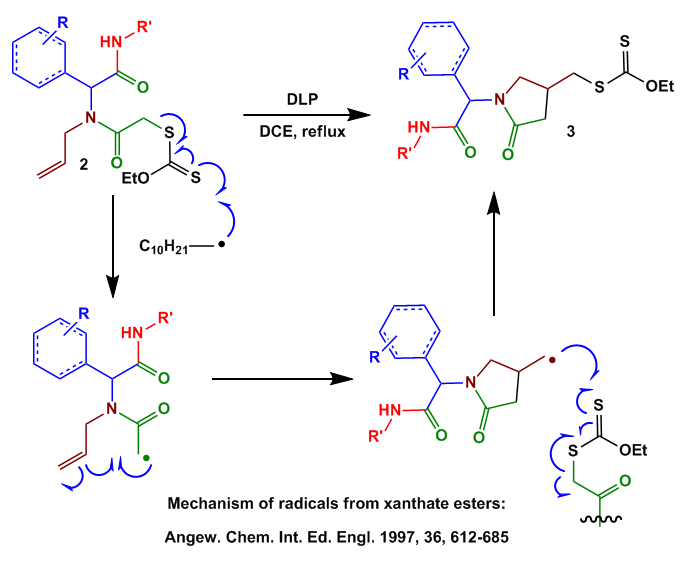 The resulting terminal radical attacks another xanthate ester yielding 3 and generates the next radical. Similar work was devoted towards the construction of azaspirodienones . 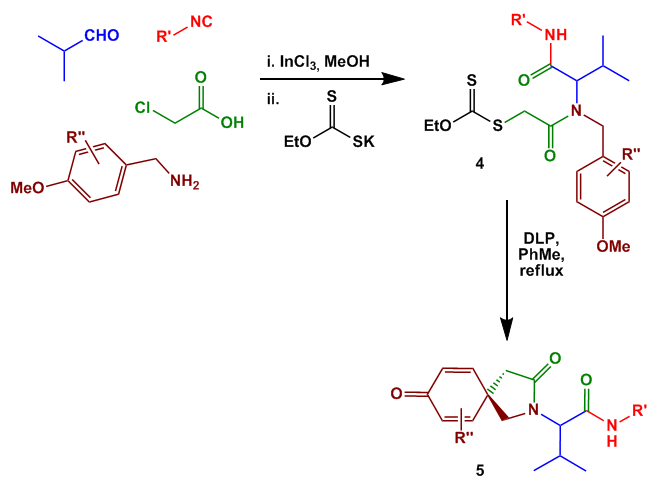 When benzylamines instead of allylamines were used, the resulting Ugi-products can be cyclized in a related manner. The last example involves a very cool radical mechanism . First the usual Ugi-product is generated. In the presence of excess Mn(III) and malonate derivatives indanes are formed. Ok, here is their solution: First Mn(III) generates a malonate radical which attacks the terminal olefin to give a secondary radical. This attacks the ipso position of the benzene ring which results in a 1,4-aryl-shift and gives an acyl stabilized radical. Reaction of this with another equivalent of Mn(III) produces a carbocation which is quenched with acetate. Hydrolysis of the N,O-acetal deprotects the secondary amide. 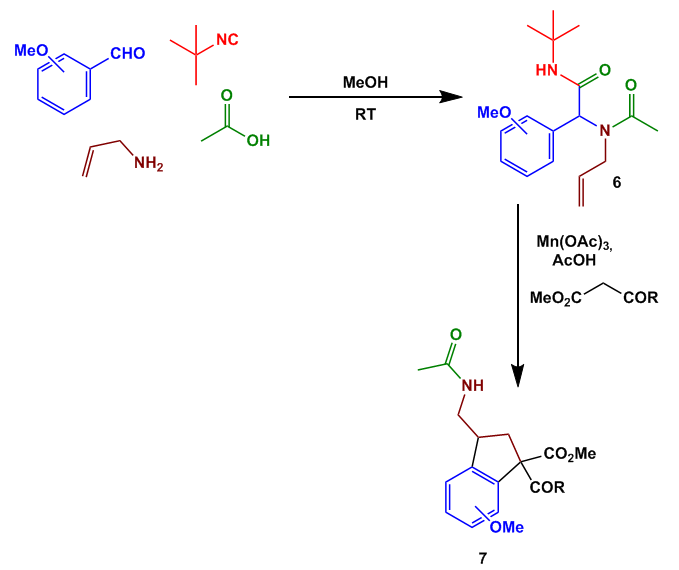 Probably at the same time Mn(III) generates another malonate based radical which cyclizes to give the indane. Nice stuff… I referenced the papers if you are interested in some more chemistry. Comments are as usual welcome. And usual THX to Bobby for proofreading.